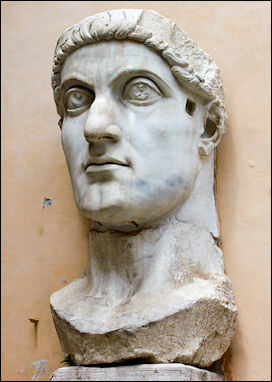 Constantine the Great (Constantine I, ruled A.D. 312-37) combined Christianity, Roman law and Greek culture and Christianized the Roman Empire. He ended the endemic civil wars of the later third century and founded the great city of Constantinople (present-day Istanbul) at the Roman city of Byzantium. He slowly reunified the Roman Empire under a single rule, proclaimed a policy of toleration towards Christians, who had been brutally suppressed under the previous Roman Emperors Diocletian and Galerius. Constantine I ruled jointly with Licinius (ruled A.D. 306-324) and as the sole ruler (ruled A.D. 324-337). He came to power after a victory in a Roman civil war and considered himself to be a successor of the "good emperors" of the second century. However he ruled as a despot, surrounding himself with pomp and spent a lot of money on military campaigns and monuments. Constantine did make some significant reforms, however, and was a great patron of the arts. He admitted bishops to his council and adopted Christian teachings on the treatment of slaves and prisoners. He changed the way the army was structured, shrinking the infantry and enlarging the cavalry, which some scholars claim changed the army as a whole and paved the way for the demise of Rome. Flavius Valerius Constantinus — Constantine I or Constantine the Great — was the son of Constantius I and Helena. He was born in the Roman province of Mossia (present-day Serbia) sometime between A.D. 271 and 273. His father Constantinus was a member of an important Roman family. His mother Helen was the daughter of tavern-inn owner. In A.D. 293, during the Tetrarchy (ruled A.D. 284-305), when the Roman Empire was split into four parts, Diocletian made Constantinus (Constantine’s father) the emperor of Gaul and Britain. Young Constantine was kept in the court of Galerius, the eastern emperor, as a virtual prisoner. In 305, Constantine escaped the court of Galerius and joined his father, who died a year later, making Constantine the emperor. For five years Constantine ruled peacefully over Gaul. Prolonged civil wars that broke out after Diocletian's abdication and death were brought to an end when Constantine finally emerged as the supreme leader in A.D. 324. Constantine moved the main capital of the Roman empire from Rome to Byzantium, a former Greek city on the Bosporus. With the move from Rome to Byzantium (later Constantinople and Istanbul) the pagan Roman empire was transformed into the Christian Byzantine empire. Byzantium was chosen as the capital of the Roman Empire because of its easily defended position, it nearness to the unstable borders along the Danube and the Middle East, and it strategic position on the major Oriental and Black Sea trade routes. Although the city was formally dedicated in A.D. 330, Constantine began making plan for the move soon after he became Supreme Leader in 324. On Constantine Founding Constantinople, Sozomen (d. c. 450 A.D.) wrote in “Ecclesiastical History, II.3": “The Emperor [Constantine] always intent on the advancement of religion erected splendid Christian temples to God in every place---especially in great cities such as Nicomedia in Bithynia, Antioch on the Orontes, and Byzantium. He greatly improved this latter city, and made it equal to Rome in power and influence; for when he had settled his empire as he was minded, and had freed himself from foreign foes, he resolved on founding a city which should be called by his own name, and should equal in fame even Rome. With this intent he went to the plain at the foot of Troy on the Hellespont. . . and here he laid out the plan of a large and beautiful city, and built gates on a high spot of ground, whence they are still visible from the sea to sailors. But when he had proceeded thus far, God appeared to him by night and bade him seek another site for his city. “Led by the divine hand, he came to Byzantium in Thrace, beyond Chalcedon in Bithynia, and here he desired to build his city, and render it worthy of the name of Constantine. In obedience to the command of God, he therefore enlarged the city formerly called Byzantium, and surrounded it with high walls; likewise he built splendid dwelling houses; and being aware that the former population was not enough for so great a city, he peopled it with men of rank and their families, whom he summoned from Rome and from other countries. He imposed special taxes to cover the expenses of building and adorning the city, and of supplying the inhabitants with food. He erected all the needed edifices for a great capital---a hippodrome, fountains, porticoes and other beautiful adornments. He named it Constantinople and New Rome---and established it as the Roman capital for all the inhabitants of the North, the South, the East, and the shores of the Mediterranean, from the cities on the Danube and from Epidamnus and the Ionian Gulf to Cyrene and Libya. “30. The Same Emperor to Evagrius: Although the crime of adultery is included among public offenses, the accusation of which is granted to all persons without distinction, still, in order that those who inconsiderately wish to cause discord in households may not be allowed to do so, it is hereby decreed that only the nearest relatives of the guilty party shall have the power to bring the accusation; that is to say, the father, the brother, and the paternal and maternal uncles, whom genuine grief may impel to prosecute. We, however, also give the said persons permission to revoke the accusation, by withdrawing it, if they should so desire. “A few weeks weeks later, on the day of Pentecost, 22 May, Constantine died at Nicomedia, still wearing the white robes of a Christian neophyte. His body was escorted to Constantinople and lay in state in the imperial palace. His sarcophagus was then placed in the Church of the Holy Apostles, as he himself had directed; it was surrounded by the memorial steles of the Twelve Apostles, making him symbolically the thirteenth Apostle. Only on September 9 did Constantine II, Constantius II, and Constans each assume the rank of Augustus, after possible rivals, including the fourth Caesar, Flavius Dalmatius, had been eliminated in a bloody coup. This bloody purge of members of the Royal family, it has been argued, may have had its roots in the religious strife between the Arian and Orthodox factions at the imperial court.